Auction sheets can be confusing to read and understand, but we are here to help you through the process. This section explains the basics of how the auction sheets are set out and what to look for when deciding on a used car to request a translation for. Auction sheet layouts do vary depending on the auction house. This auction sheet, provided by USS, explains what all those boxes mean. The first 6 items below can be used in combination with numbers 1, 2, 3 and 4. 1 being small, 2 medium, 3 large and 4 extra large! The following tables outline the basic condition of the car and options it may include. The first table relates to the exterior condition, the second the interior, the third options. It's important to note that these are general guides and the specific auction sheets contain substantially more information regarding condition. The vehicle is less than 12 months old from the first registration date and travelled less than 10,000 km. The vehicle is less than 36 months old from the first registration date and travelled less than 30,000 km. The vehicle has travelled less than 50,000 km. The vehicle has travelled less than 100,000 km. The vehicle has travelled less than 150,000 km. The exterior has some noticeable scratches/scrapes and/or dents, may contain rust or corrosion. The exterior has more noticeable large scratches/scrapes, paint blemishes, and/or large dents. Very poor condition, save up for something better. Minor accident vehicle to which the damage has been repaired. More substantial accident vehicle to which the damage has been repaired. Accident car or "As it is condition"
Engine/Gearbox may no longer work. The vehicle interior is as new. The vehicle interior is in excellent condition, may contain minor wear marks, may require light cleaning. The vehicle interior is in average condition and may contain cigarette burns, torn upholstery, screw holes, cracked dash, glue. Interior will require cleaning. The vehicle interior is in poor condition, worse than 3 and will require repair and heavy cleaning. Interior may smell. The vehicle interior is in very poor condition and will require extensive repair. Interior may smell. The date of first registration is the only date that is used in Japan - it is the only date that appears on any official paperwork. The date of manufacture does not appear on any official paperwork. There is one small area on the auction sheet for the seller to disclose the date of manufacture, but it is not mandatory and rarely filled in. So to find the date of manufacture, we must use other online resources. Every 2 years a car must undergo shaken - which is the process for registration. Cars must be inspected by government inspectors to make sure they're in good condition and fully serviced. Even a broken rubber booty over a CV joint and the car will fail this inspection. During this inspection the kilometers of the car are recorded – this started in the early 2000's. The auction inspectors will check the mileage against these records to make sure the current mileage is not less than the last recorded shaken. The auction inspectors will also use other techniques such as identifying changed meters, to highlight a car with unknown mileage. GTR's from the 1990's are a great example as owners loved to change the meters to the Nismo version. 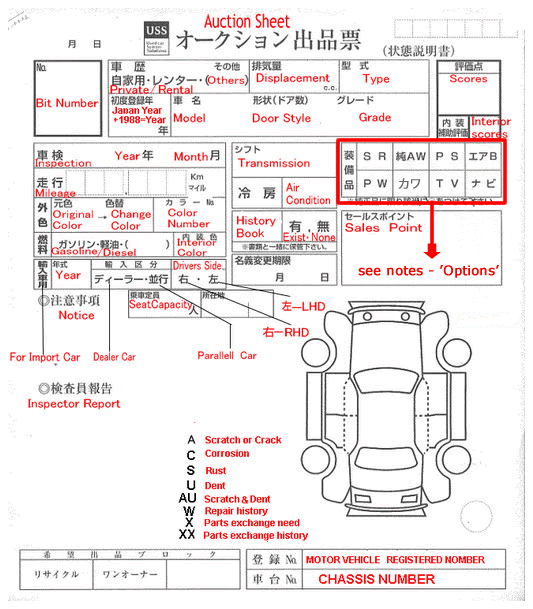 Cars with unknown mileage are clearly indicated on the auction sheet, and is included in our translations. Cars imported into Japan can either be imported officially by the dealership or privately. This is also indicated on the auction sheet and is included in our translation. Dealer imported cars are sold brand-new in Japan through the dealership or associated dealership like Yanase for Mercedes-Benz. Private or parallel imported cars can also be brand-new when arriving in Japan the first time. The date of manufacture and the date of 1st registration need to be checked with these cars to make sure it's less than 6 months or so. If a long time has passed between when the car was manufactured and when the car was first registered in Japan, than the kilometers are always questionable. This may not matter so much for rare cars, the value of which can only be ascertained through our close inspections. The history of privately imported cars before they reach Japan should be verified by any potential buyer.